Ok everyone, Valentine's Day is fast-approaching, and what better way to wile away the days than a contest! 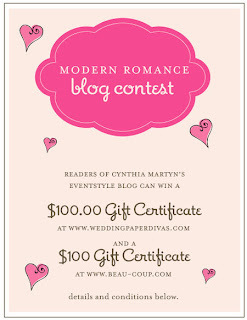 I am happy to announce that the fabulous folks over at Wedding Paper Divas, which offer beautiful, modern wedding invitations, and Beau-Coup.com, which offer lovely, romantic wedding favours, are both offering a $100.00 gift certificate for my blog readers! 1. Visit www.weddingpaperdivas.com and select one "modern" wedding invitation & then mosy on over to www.beau-coup.com and select a "romantic" wedding favor from the many showcased on their site in a colour/theme that coordinates with your invitation selection. Both the invitation and favor should fulfill YOUR unique sense of a modern, romantic wedding. 2a. Save the unique wedding invitation as a "favorite" on the Wedding Paper Divas website. This is done by clicking on the "Save in Favorites" button on the desired wedding invitation page. 2b., subscribe to the Beau-coup newsletter: http://www.beau-coup.com/newsletter.htm. 3. Then, come on back to this blog post, and comment with links to your two selections that best fit your idea of a MODERN ROMANTIC wedding. You must include a link to your selected invite and favor to be eligible to win. I will randomly select a winner on February 14th, so watch this space for your name! Contest is valid worldwide. Good luck!